Tucked in the middle of Oklahoma sits the small community of Okarche—population 1,300, give or take a few. Ask most folks in Oklahoma about Okarche and Eischen’s Bar might be the first thing that comes to mind. After all, the historic institution claims to be “the oldest bar” in the state and is famous across the nation for its secret-recipe fried chicken. Ask residents of Okarche what their town is known for, however, and it wouldn’t be surprising if Temtrol quickly rolls off the tongue. Established in 1955 as a small manufacturer of air-handling equipment for Tinker Air Force Base, Temtrol has since grown to be a world-renowned manufacturer. Consulting engineers who once were limited to working with standard modular units produced by catalog manufacturers now have the option of an HVAC unit custom-tailored to meet their special requirements. Temtrol works closely with its clients to guarantee the units they select will do more than “just meet the project needs” because it’s specifically designed for a particular job. The company’s equipment is used across the globe, from the 50-story Devon Energy Tower in Oklahoma City to the Queen Mary docked in Southern California. For years, the Okarche plant had experienced a steady growth and with its existing facility nearly bursting at the seams. So a rapid growth in business was not real high on Temtrol’s priority list. “We had maxed out the capacity of this plant,” said Andy Halko, general manager of Temtrol, which is now a subsidiary of Nortek, a global, diversified company with countless market-leading brands delivering broad capabilities and a wide array of innovative, technology-driven products and solutions to corporations and consumers around the world. For years the Temtrol leadership team contemplated how to grow its business without having to relocate from the loyal community of Okarche. The concepts of continuous improvement and Lean Manufacturing kept entering the conversations. Lean Manufacturing dramatically transforms the way manufacturers do business. It’s designed to put processes in place that reduce overproduction caused by traditional scheduling systems. In other words, learning to make what customers want when they want it. Lean also establishes a systematic approach to eliminating waste and creating flow throughout the entire company, while helping develop and implement a long-term plan to streamline operations for success. “We were planning a major plant expansion and needed some guidance,” said Halko. For advice, he called on Mike Raymond, a manufacturing extension agent with the Oklahoma Manufacturing Alliance. Raymond is one of 17 MEAs working throughout the state to grow industry. He is sponsored locally by Canadian Valley Technology Center and Redland Community College. One of the first things Raymond and Halko did was work on qualifying for the ODFA Economic Development Pooled Finance Program, which allowed Temtrol to initiate a $7.5 million expansion project. Long before the expansion project jumped from the drawing board, however, focus was put on bringing in experienced leaders to help with the radical changes forthcoming. Halko first hired a person with a strong manufacturing background, who then brought in some talented individuals he had worked with in the past. They began formed a strong working relationship with Raymond and the Oklahoma manufacturing Alliance. Changes quickly began. Halko said that while employees were brought into the process, it wasn’t always smooth sailing. For instance, about three years ago the decision was made to put lines on the production floors. The first six months proved difficult. To help employees embrace the changes, plenty of drills were performed. That also proved beneficial in building teamwork among the workforce. Halko said one of the drills involved beads and pipe filters—something Toyota had used at many of its plants. The drill involved setting up teams in cells and batching, timing the groups to see how long it would take to batch. Then they would throw an occasional curveball, like the customer changing something about the order at the last minute, just to see how the group would react. It wasn’t long, however, that the leadership team and employees worked out a similar crisis using Lean concepts, with the customer extremely pleased with the outcome. 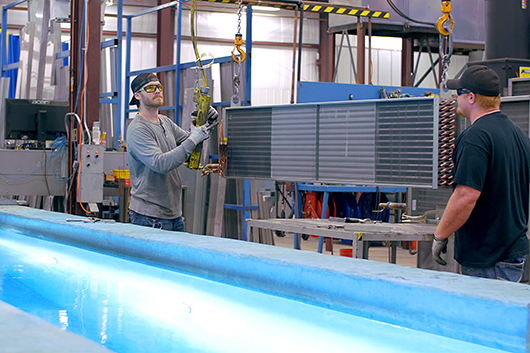 The partnership between the Oklahoma Manufacturing Alliance and Temtrol has helped the manufacturer increase throughput by more than 25 percent. In fact, the company has grown 26 percent since 2011, going from around 290 employees to more than 350. Although Halko would be the first to admit there were times it looked as though the cultural transformation just might not happen, he’s glad his leadership team and employees rolled up their sleeves and embraced the uncertain path. Temtrol HVAC equipment is used across the globe, from the 50-story Devon Energy Tower in Oklahoma City to the Queen Mary docked in Southern California.